Jersey has many interesting modern pounds to collect. The list includes the Royal Wedding commemorative pound, the unusual shaped Bicentennial Battle of Jersey pound, the Parish Series pounds, and the Ship Building Series pounds. This coin was minted at York Stampings Ltd. Birmingham. The dies were cut by H.B. Sale Ltd., Birmingham while the blanks were prepared by Sheffield Smelting Co. Ltd. Notice that the reverse, designed by Norman Sillman and modeled by the artist Terry George, has three florets of the Jersey Lily (Amaryllis belladonna). An uniface trial striking of the reverse is known to exist. 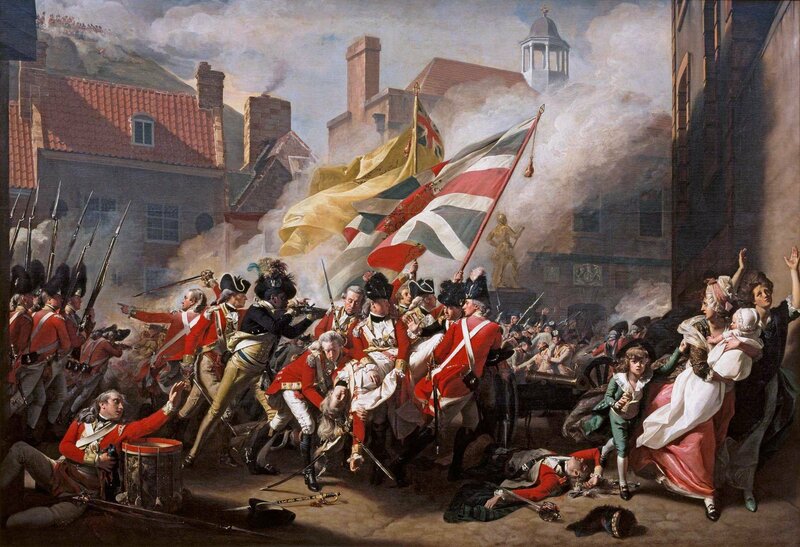 During its history Jersey has been attacked many times by the French, the last occasion being the Battle of Jersey in 1781 when the French Baron De Rullecour and his forces landed and reached the capital of the island, St. Helier. In defense of the island, Major Peirson, the senior military officer present, rallied the militia and garrison forces. A battle took place and the French forces surrendered. In commemoration of this historic event the reverse of this coin features the badge of the Royal Jersey Militia. The twelve parishes are St. Helier, St. Saviour, St. Brelade (probably a variation of St. Brendan), St. Clement, St. Lawrence, St. Peter, Grouville (which was originally St. Martin de Grouville), St. Martin (which was originally St. Martin le Vieux), St. Ouen (after the 7th century Archbishop of Rouen), Holy Trinity, St. John, and St. Mary. The 1981 census determined the order of issue for each coin. An edge inscription CAESAREA INSULA, the name given to the island by the Roman Antonius in AD 300, meaning "Island of Jersey" also features on all of these one pound coins. The first pound coin of the Parish Emblem series was released on 21 April 1983 for the parish of St. Helier. The reverse depicts a shield charged with two crossed gold axes on a blue field. St. Helier's feast day is July 16, and there is an annual procession from the center of St. Helier, down to the beach, along the causeway and out to the chapel, which was built over the site where St. Helier lived, and which is known as the Hermitage. There is a little natural hollow in the rock inside the Hermitage known as St. Helier's Bed. A monastery was founded on the Islet, but a mortar bomb finally destroyed this on the 9th of November 1650. The explosion, which blew the old building to pieces, was so devastating because the Royalist Governor of Jersey was using the old Abbey church as a gunpowder store during the English Civil War. English Parliamentary forces were besieging the Castle, which had been built around the monastery at the end of the 15th Century. Elizabeth Castle is now a popular heritage site and a cross marks the site of the ancient monastery. Today, St. Helier is the seat of the Islands government and administration, and most of the States of Jersey buildings are centered on the Royal Square. These include the Royal Court, which dates from 1866, and the States Chambers - Jersey's seat of government. Just off from the Royal Square is found the Town Church, which is the oldest building in town. There has been a place of worship on this site since the eleventh century. The second pound coin has a shield charged with a crown of thorns and three nails recall the Saviour’s suffering. St. Saviour is another of the more rural parishes and it is here you can see the patchwork of fields. It is also in this parish that you can visit the grave of Emile Charlotte Le Breton, or as she is far better know, Lillie Langtry. The next pound coin has a shield charged with a silver fish on a blue field. Saint Brendan’s symbol was the fish, as on the Saint Brelade emblem. The parish of St. Brelade covers the south-west tip of the island. It has a very extensive coastline and therefore has many attractive beaches to choose from as well as cliff path walks with beautiful views. The parish crest of a silver fish on a blue background was the personal symbol of St. Brendan, the sixth century saint so famous for his travels. In the late nineteenth century, the St. Brelade’s Bay Hotel was hardly more than a pub owned by a local brewery. It was situated where the Cocktail Bar is now. Apart from the parish church, the only houses in the bay at that time were four farms, some fishermen’s cottages and the Martello Tower. The room rate at that time was seven shillings and sixpence for full board, with free use of a bathing machine; a lobster lunch was one shilling and sixpence. This coin has a shield charged with a gold anchor on a blue field. The emblem of the anchor comes from the legend that St. Clement, the fourth Pope, was tied to an anchor and thrown in to the Crimean Sea. He was henceforth regarded at the protector of sailors. The rocks off the Parish coastline are particularly dangerous. 1985 is the centenary of the death of Victor Hugo. This famous French author spent his first three years of exile in the Parish. Neolithic graves were found at La Motee (or Green Island), which lies just off the Parish shore, and the nearby Rocqueberg (or Witches' Rock) was the venue for dark rites in bygone times. Samares Manor is named after the salt marshes and has attractive grounds, incorporating an herb garden. The design represents the grid-iron (grill) upon which St. Lawrence was roasted alive. The Parish of St. Lawrence is the central Parish of Jersey. Its beautiful valleys and reservoirs provide a tranquil setting contrasting with the seascapes of some of the other Parishes. Situated in the Parish is Morel Farm, owned by the National Trust for Jersey, with its cobbled courtyard, arches and outbuildings. A reminder of the German occupation of Jersey from 1940 to 1945 is the German Underground Hospital, built by labor supplied by the Todt organization, which houses an exhibition depicting this era of the Island's history. St. Matthew's Church, known as the Glass Church from its embellishments of Lalique glass, and the Coronation Park at Milbrook are reminders of the benefactions of Jess Boot, the founder of Boots the Chemist. The design of two crossed keys represents the keys of Heaven in the charge of St. Peter. The Parish of St. Peter or the "countryside parish" is unique in several ways. It is the only parish, which has two coastlines -- one partly in St. Aubin's Bay and the other partly in St. Ouen's Bay. Its Parish Church has the tallest spire of all the parochial churches and it's the only one to support an obstruction red light -- because of its position in relation to the Airport. Ancient documents describe the Church at San Pietro in Deserto -- St. Peter in the Desert -- presumably the close proximity of the sand dunes was the reason for this. Although a flying service to Jersey commenced in 1924 with airplanes landing on West Park sands, it was not until 1937 that the States opened the Airport at St. Peter at a cost of 128,000 Pounds. Initially it covered a mere 83 acres. Many extensions have been made over the years and now it is one of the busiest airports in the British Isles. One interesting relic of Tudor times remains in the Parish. Only six cannons made in the 16th century by gunmakers Owens of Houndsditch are known to be in existence and one stands at the foot of Beaumont Hill. St. Peter's Valley is a picturesque area and the National Trust's property "Le Moulin de Quetteville" is a lasting reminder of an era in Jersey's history when flour milling was a local occupation. Eight alternating bands of silver and red form the Parish emblem and this variation has been captured in the detailed engraving of the coin. The emblem is actually known as St. Martin of Grouville and its origin dates back to Louis XI of France. The Parish of Grouville is the southernmost of the two parishes that form the east side of the Island and it has many delightful features. It boasts a fine sandy beach in the Royal Bay of Grouville and at low tide, a very wide area of shore is exposed to show an expanse of rocks and reefs, all of which make navigation in this area very hazardous. The prefix 'Royal' to the Bay of Grouville was added in 1859 by command of Queen Victoria following a visit to Jersey. In the extreme western side of the Parish is La Hougie Bie, a prehistoric burial ground. It is steeped in local history and its Neolithic tomb is said by many to be one of the finest to be found in Europe. It is of considerable interest to residents and visitors alike. Probably the best known feature is Grouville Common -- a vast area of sandy heath bordering the coast. Over the years it has been used for a variety of purposes. In the 18th century, when France was the enemy, the low lying common was heavily fortified and the several Martello Towers around the coastline are reminders of those far off days of anxiety and strife. In the 19th century horse races were held on the heath and these culminated in an annual carnival, which was very widely supported. In time, that gave way to the pursuits of golf, and from early beginnings and with such players as Harry Vardon and Ted Ray (both British Open Champions), the links have become the headquarters of the Royal Jersey Golf Club. Seven alternating silver and red horizontal bands form the emblem for this coin. The emblem is that of St. Martin Le Vieux (1042 AD). The Parish of St. Martin is in the east of the Island, a quiet and rural area with many delightful features. Although it is predominantly agricultural, tourism plays its part with visitors to the Island enjoying the many bays and coves that form an extensive coastline. However, the most prominent feature must be Mont Orgueil Castle, which dates back to the 13th Century. It is a fine relic of great historic interest standing high above the little harbor of Gorey, dominating the east coast. Beyond Gorey there are such bays as Anne Port, Archirondel, St. Catherine and Rozel --- all offering natural unsoiled beauty. The breakwater at St. Catherine's stretches well out into the bay and was built in the 1840's by the British Government as part of a harbor scheme to provide greater protection to the Island. Unfortunately it was ill placed and never achieved it purpose. Today it is a haven for local fisherman, both amateur and professional. From most vantage points around this coastline there are fine views of a reef of islets and rocks called Les Ecrehous which, although are midway between Jersey and the French Coast, form part of the Parish of St. Martin -- yet another unique feature. The emblem, which dates back to A.D. 1053, is a Latin cross of gold on a blue background. St. Ouen is the largest of the twelve parishes of Jersey and forms the north-west corner of the Island. It is divided into cueilettes, not vingtaines as in other parishes. This is an old custom and survives only in St. Ouen. One of the many features of the parish is St. Ouen's Pond, by far the largest stretch of natural freshwater in Jersey. It is owned by the National Trust for Jersey and provides a very necessary nature reserve. Continuing along the coast road, one arrives at Le Mielle de Morville, an area that has recently been subjected to landscape restoration. Amenities, not previously available, may be enjoyed today. Picnic, barbecue, and parking areas allow for participation in a wide variety of leisure activities. As the vastness of St. Ouen's Bay edges towards L'Etacq, the expanse of the beach gives way to the rugged moorland terrain surrounding Grosnez where the remains of the Castle dating back to the 14th century, are to be found. The cliff walk at Les Landes provides excellent views of this exciting coastline and serves as a vantage point for distant views of the other Channel Islands. There is much to interest the archaeologist in St. Ouen. The Dolmen des Monts at Grosnez is a prime example of a Neolithic passage grave and at Le Pinnacle -- a rock of some 200 feet rising sheer out from the sea -- there are further remains of the Neolithic age. Visitors too will find much to interest them in St. Ouen's. The expanse of quality beach, horse racing at Les Landes, a woodcraft center at L'Etacq and a Battle of Flowers Museum displaying the skills and talents of a lifelong exhibitor, Miss Florence Bechelet, are just examples of what can be seen and enjoyed. The emblem of the Parish of Trinity - La Sainte Trinite - dates back to AD 1090. It is an unusual design and shows in diagrammatical form, the mystery of the Trinity. The initials inset in the design represents Peter, Filius, Spirtus Sanctus and Deus. Trinity is a large but sparsely populated parish with a coastline running from the northern end of Rozel Bay through to Giffard Bay. A fairly strenuous walk along the coastal paths provides superb views as well as the opportunity to explore caves dotted along the rugged coast. These paths skirt the highest point in the Island -- Les Platons -- that is some 534 feet above sea level. Radio, television and some navigational aids are positioned in this area. Bouley Bay is a major attraction. This picturesque little bay nestling between high cliffs is reached by a steep winding hill now famous as a National Hill Climb venue. The bay, which shelves rapidly, is recognized by visitors and residents alike as an ideal center for skin diving pursuits. Conservation plays a major part in Island life, and Jersey is fortunate, that under the inspired leadership of Gerald Durrell (zoologist and author), the Jersey Wildlife Preservation Trust at Les Augres Manor has gone from strength to strength. The Trust aims to preserve all forms of wildlife which are in danger of extinction and it has achieved many successes. The States of Jersey Agriculture and Fisheries Committee has its headquarters at the Howard Davis Farm and a comprehensive agricultural and horticultural advisory and research service is provided for the benefit of the industry. The farm was donated to the Island by the late T.B. Davis in memory of his son who was killed in World War I. There are many other features to be seen and enjoyed in the Parish of Trinity -- the Parish Church, Trinity manor and common land at Le Jardin d'Olivet are just some examples of what awaits the explorer. St. John's coastline is wild and rugged with fantastic views across to Sark and also in the distance, the coast of France. There are many caves along this coast, the most famous being Wolf's Caves - which you can enter after a very strenuous clamber down the cliffs when the tide is out! Bonne Nuit Bay (Good Night) was once a haunt of smugglers and still a place of myth and legend. Long ago a custom on Midsummer's Day was for Islanders to come to Bonne Nuit Bay and be rowed around Cheval Roc (a rock situated out at sea), which it was firmly believed, was to avoid bad luck! The emblem of the Parish of St. Mary -- St. Marie d'Arsmoustier ("of the Burnt Monastery") is dated 1042 AD and is a silver lily on a blue background. Although St. Mary is the second smallest parish and the least populated area in Jersey, it boasts much natural beauty. Superb views are enjoyed by walkers who take the cliff path from Sorel through Le Mourier Valley and on to Devils Hole, whilst those who look for alternative relaxation can enjoy the splendid beach at Greve de Lecq where the sands are truly golden and the sea of the deepest blue. Also at Greve de Lecq are the Barracks, which were built to house garrison troops when the French threatened to invade the Island at the beginning of the 19th century. These buildings, now restored, are the property of the National Trust for Jersey and are open to the public. The Trust also has its headquarters at The Elms, St. Mary, a fine example of an 18th century dwelling house and subsidiary farm house. In earlier times, when knitting was a local industry, much of the land in the Parish was given over to sheep rearing. Those days have long gone and the accent today is on dairy and arable farming as well as the cultivation of vines. During the nineteenth century Jersey enjoyed great economic expansion, largely due to the important influence of the shipbuilding industry. To salute this age-old craft the Royal Mint was commissioned to strike a series of seven one Pound coins. Six of the coins depict locally built vessels while a seventh bears a representation of the official seal of the Bailiwick in use from 1844 to 1870. The choice of ships was determined to show the great diversity of ship building in the States. · The reverse of each coin is the work of Royal Mint engraver Robert Evans. · An edge inscription CAESAREA INSULA, the name given to the island by the Roman Antonius in AD 300, meaning "Island of Jersey" also features on all of these one pound coins. · Gold, 22 carats 19.65grams, proof coins were authorized with a mintage of 250. · Proof coins containing 11.68 grams of silver with a world wide mintage of 3,000 were also minted for each issue. The first coin in the series depicts a schooner, the Tickler. This two masted schooner was built in Jersey in 1858 for the Le Boutilier Company. The Tickler with a weight of 93 tons, measured 93 feet long, had a beam of 19 feet and drew some 10 feet of water. She plied the trade routes of northern Europe and the Mediterranean, with occasional voyages to Newfoundland. After ten years in service, the Tickler was mortgaged with the Jersey Joint Stock Bank and was subsequently sold to Charles Robin and Company. Some three years later Robin and Company, a principal ship owning company on the island took control of the Tickler. Because of financial difficulties the schooner, along with other vessels, was sold to France in 1888. She was last mentioned in the Lloyd’s List in 1864. This coin, the second in the series, features the Percy Douglas, a three-masted ship named after Major General Sir Robert Percy Douglas, then Lieutenant Governor of Jersey. Although the Percy Douglas was built in Beaumont, Jersey by Edward Allen, it was registered in Liverpool to Thomas Hayley to whom the ship was awarded when Edward Allen went bankrupt. Registered as 781 tons and launched on 8 August 1861, the Percy Douglas worked the China routes until 14 December 1871 when it was finally wrecked after running aground off Rangoon, India. The third coin in the series depicts a two masted brig, the Hebe. The Hebe was built by Daniel Le Vesconte of First Tower and owned by the Le Boutilier Company. This brig, launched in January 1861, weighed 236 tons, measured 119 feet long with a beam of 24 feet and had a draft of 13 feet. She plied her trade on the North Sea and the North Atlantic. She was also used to ferry emigrant workers from Europe to Canada. She was wrecked in October 1887 on Bryon Island in the Gulf of St. Lawrence. And by the way, Hebe was the daughter of Hera and Zeus and the sister of Ares and Eleithyia. She is the goddess of youthful beauty and the cupbearer of the Olympus, later to be replaced by Ganymedes. She married Herakles after he won immortality. The reverse of this coin, the fourth in series, features the Bailiwick Seal, a square shield Coat of Arms originating from those granted to the Island of Jersey by Edward I in 1279. This coin, the fifth in the series, features the Gemini, a three-masted barque built by Daniel Le Vesconte of First Tower for Messrs. Deslandes and Pallot. The Gemini was registered as 430 tons and launched on 7 May 1864, making voyages to China, South America, the West Indies and New York. Records indicate that the crew was paid 2.5 pounds per month and the mate received no less than 5 pounds. She was eventually broken up in Singapore in 1880 after being declared unseaworthy. However, some experts believe that after a name change, it sailed for many more years. This coin, the sixth in the shipbuilding series, features the Century, a 186 ton, two-masted brigantine built by Daniel Le Vesconte of First Tower. Launched on 14 April 1866, the Century was so named to commemorate the centenary of the founding of C. Robin and Co. Whilst bound from Gaspé, Canada, for Rio de Janeiro on her maiden voyage she was caught in a hurricane and dismasted. After repairs she continued to work on the triangle run of South America, Jersey, and Gaspé Bay. The Century was finally lost in October 1898 after becoming stranded at Val Bay, Gaspé. The final ship in the series is the 63 ton topsail schooner Resolute which was built by Thomas Le Houquet at St. Catherine's and owned by George Noel, father and son. They used it for trade before the ship was wrecked during a hurricane on 29 August 1905 at the entrance to Harbour Briton, Newfoundland, losing one of her five crew members. · For the 1998 dated coins 300,000 were struck in 2000 and 335,000 in 2002. · For the 2006 dated coins 100,000 were struck in 2006 and 5000 in 2012. Images courtesy of Mark Goldberg of Goldberg Coins and Collectables. This exceeding rare and sensational 1991-1994 Jersey Shipbuilding Series includes seven one-pound Proof gold coins. The coins are piefort which is double the thickness of a normal issue. The coins measure 22.5 mm in diameter, but the weight of each coin is .5794 ounce of gold for each coin and a total gold content of 4.0558 ounces in the set of seven pieces. Just 250 of each coin was issued in gold. The reverse design, the work of Mr. Alan Copp, was chosen by a local design competition. The design incorporates the parish crest of each of Jersey's twelve parishes and uses modern technology, as a latent feature, for illustrating the coin's value. · For the 2006 dated coins 10,000 were struck in 2006 and 5,000 in 2012.